As, when and while can be used to talk about either actions or situations which take place at the same time. But among all, there is a difference between all the three and students always get confused between them. As is used to talk about the short actions or situations which are either going to happen or already happened in the past at the same time and at that time we use "As"
As I opened my eyes, I saw a stranger at a distance. As is also used to talk about the two similar situations which occur together and in that case we have to use as with simple tense. As I get older, I get more pessimistic. As is also used to introduce a long background action or a situation. As He was going to my office, I Saw Jyoti. Both this words are used to introduce a long background action or situation. Both are dependent on another event if that happened or happened then and then only another situation occurs. In that case generally, we use continuous tense to shoe the long actions and situations. 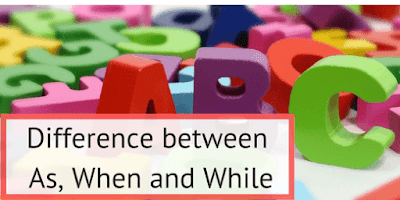 When and while being used in a clause sentence and both are either used at the starting of the sentence or the end of the sentence. He was taking a dinner when the doorbell rang. While we were decorating a home, quest came into the house. As and when are similar in meaning to each other but used in different situation. When and while is opposite to each other. When is used while we refer to the ages and period of life. When is used to refer to ages and periods of life? As is used to describe the function of a person or object. While is used to talk about two long actions or situations which go or went at the same time. In that case, use continuous or simple tense. When the man was out working in the field, He helped with milking the cows, feeding the calves and the pigs. While she was working, she often listened to classical music. As he was leaving for the shooting, a crowd of photographers gathered around him. As Viral walked to the main door, she thanked him for a lovely dinner. As they were signing the agreement, they noticed that a sheet of paper was missing. She spent long evenings talking in my sitting-room while she played the music. When you start the motorcycle, there’s a strange noise.